Doing hand stitching and embroidery can be so rewarding. I find it relaxing and the perfect activity that you can take around wherever you are. This embroidery tutorial will show you how you can make your own design and template with a picture. 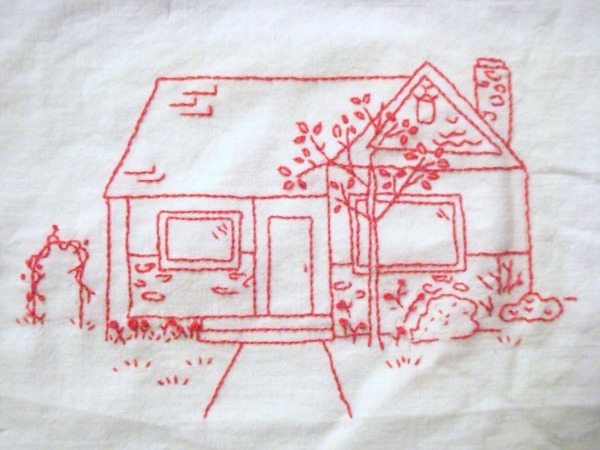 It’s super simple and a great way to customize an embroidery for your own home or for someone else. 1} Take a picture of your home. Digital if at all possible. Much easier, and the most immediately rewarding too. 2} Change the size to around 4 X 6 inches in size. You may choose to do a different size. 3} Print off picture in black and white –the size you would like. Oh ,isn’t my home just so cute! That is a cherry tree in the front there…yup, it’s a monster that keeps growing straight up even though we trim it. 4} Take a Sharpie marker and start drawing lines on all the major parts of the home + stuff around it. Like the roof, the chimney, the tree, the windows, doors….get the idea? Don’t make me list anymore. Now, like the paint program we can move things around. go ahead. no one will check. I didn’t include that 5 foot rosemary bush right under the tree. 5} Lay a blank white piece of paper on top of that sharpied black and white picture and put it on a light box. your arms will thank you later –you know, holding to the window-. Trace again. i know, but it will help! Just do it! If you look closely at this one and the finished product you will find some changes. There is a window in that big triangle that the tree was covering up! and i moved the sidewalk over so it was more ‘centered’. 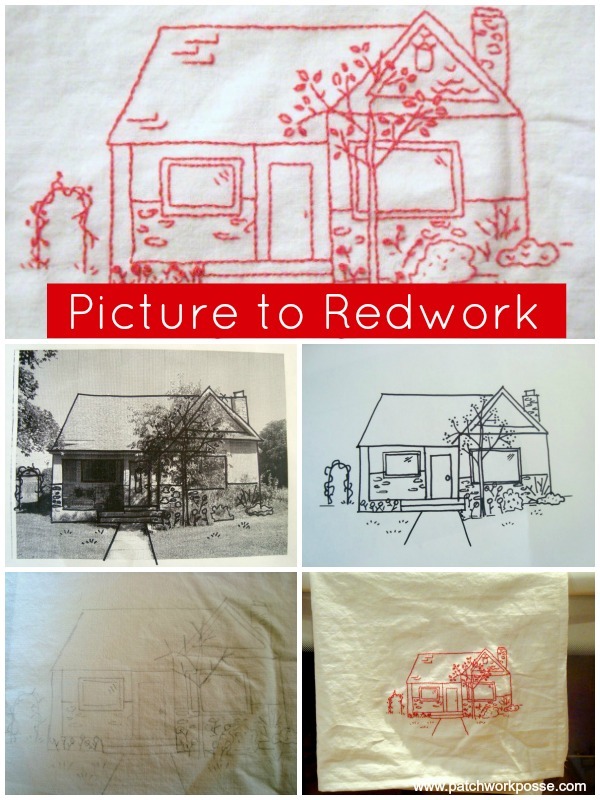 6} Now is the time to get that tea towel, cotton, muslin or whatever you would like and trace the pattern again onto the fabric. I used a mechanical pencil. Easy. 7} Put into hoop and stitch. Stitch like there’s no tomorrow. I did add some ‘architectural’ details- like some shingles on the roof, some rock where the rock is, and some more round siding in the big triangle, and some lines on the windows. This helps take up big spaces, and makes them look a little better to the eyes. Don’t worry about getting everything in it. You won’t and it will look too crowded. Your mind does a great job of making some stuff up and it looking ok. So don’t worry about it. I mean look at that funky vine growing up the arbor on the left. whatever…. So get out there and take a picture and imortalize your home. So this one now hangs in the kitchen. Not sure if i want to use it or not yet. What a cute idea….I love it! I live in a house that's only two rooms wide, but very long at the front… maybe a table runner… laughs! That's really lovely. Cute idea! Simple yet brilliant. Thanks for the idea. Gorgeous! what a great idea for Christmas presents. LOVE IT LOVE IT! This is such a wonderful project. I appreciate your sharing it with us and will give it a go. What a great idea! I can't wait to try this. Thanks so much for explaining. I'll try to remember to post to your blog when I make one. Feel free to check out my blog, too. I love this idea! So cute and special, too! Thank you so much for showing this idea! What a wonderful gift this would make! Sheer genius! Thanks for this wonderful tutorial !!! Need to add this to my Handicraft to do list !!! I do like this idea…one can save money by using photos from magazines and such, especially if one is like me….not a drawer! Thanks for this wonderful idea! i hadn't thought of using pictures from magazines before. that might open a whole new pandora box of cuteness! You have given me many wonderful ideas! Many thanks for all you’ve shared! 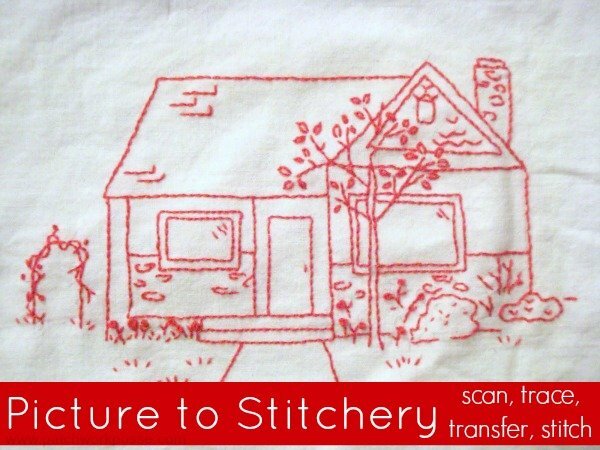 I know this tutorial is old, but I just found it and absolutely LOVE it, I need guidance, how do you get the drawing from the paper to the towell. I want to make these for gifts. Please let me know anyone if you have made this. I love this! May I repost on my blog? I think I might even be able to do this … woot!!! yay! that’s what it’s all about. do share when you have something sewn up! what an awesome idea! I’m going to do this with my little cape cod! oh my gosh that would be cool! you should show it off to me when you are done. This is SO what I needed to see. I’ve been looking for a handwork project to just help me decompress after teaching all day. . .also a wife and mom, so minutes are precious and few. I can’t wait to get this all set up and ready to go so I can start stitching away!!! Thanks for the great details and for sharing. Completely AMAZING~! I can’t wait to try it! What gifts! Memories from the mind~into the heart forever~!!! My friend is having a house built. This would be a great house warming gift for her . I Love This! I have always wanted to make a Christmas Tree skirt using red work of my Christmas Village. Thank you so much for the pattern. Absolute genius. p. s. I always feel so sad for projects that don’t get used. They need love too! And those aren’t just hand prints, those are family hugs. These are towels, pillow cases, not religious icons. Go ahead. Use them. The family will thank you too. Thanks for making this tutorial, I am making another for a dear friend’s daughter’s wedding now. I just love homemade gifts, I hope others do too!